Germany - TS Veranstaltungstechnik GmbH & Co. KG has recently extended its range of Clay Paky lights by adding 38 A.leda Wash K10s and eight Alpha Spot HPE 700s to the 14 Alpha Spot 300s it already had at its disposal. The firm also purchased a grandMA2 light, a VPU light and a 4Port Node onPC from MA Lighting. In the past, they had already chosen a grandMA2 ultra-light. 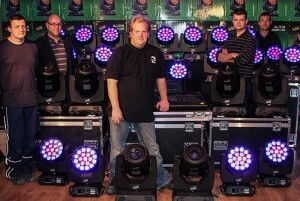 "Since we are a benchmark as live music technical support goes in the South of the country, with more than 200 shows a year, and since there is a growing interest in dry hire throughout Germany and Austria, it is vital for us to be able to count on highly reliable and easy to maintain products," said managing director Florian Daniel Tospann when commenting on their purchase. "We chose Lightpower for the same reason. They are an unequalled trustworthy distributor, who has so far joined us as a prestigious partner in every situation." Tospann continued: "Besides providing all round technical support to live bands, we have been successfully using all the equipment at the Grandls Hofbräu Zelt (beer festival) in Cannstatter Wasen (Stuttgart) for years. This is another event where the technical equipment must work flawlessly 24/7 for several weeks. It is vital not just for our workers, but also for our customers." "The new products have been successfully used at other events, including productions by Mickie Krause, Peter Wackel and Anna-Maria Zimmermann, shows focused on some Greek stars, entertaining cabaret shows, like the Ingo Appelt show, and music festivals, such as the 'metal invasion' of Kreator fans at Straubing or the Children of Bodom," Tospann added. "Clay Paky and MA Lighting products never let you down!" The Clay Paky A.leda range (K20, K10 and K5) consists of powerful LED washlights. Thanks to individual LED control, they not only offer great effects and a variety of functions, but also meet Clay Paky's high quality standards. They are extremely quiet and therefore particularly suitable for places where noise is important. All A.leda moving lights have 15 W RGBW LEDs, which can be used to achieve powerful saturated colours and a wide range of pastel tones and shades of white. Furthermore, there is also a CTO channel for individual colour temperature adjustment. Both the dimmer and RGB colours are available on the 16-bit channel, which not only allows uniform dimming but also delicate long colour fades. 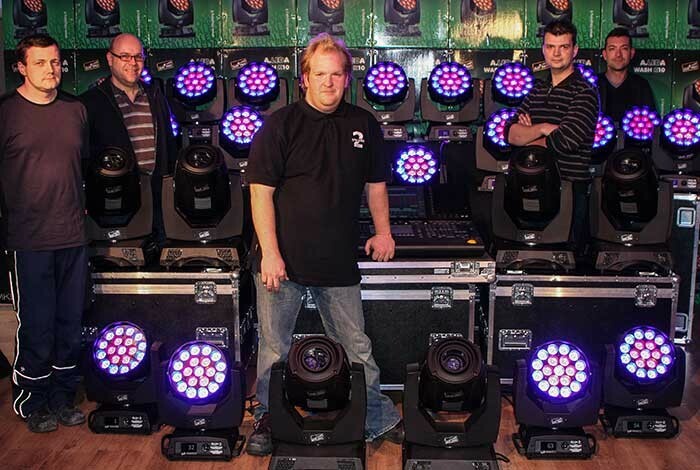 The K10 has 19 LEDs and reaches a brightness of 9,000 lumens with a power of 380 W.
In picture: Florian Daniel Tospann (second from right) with his team and some of the new products.